Revolution Teal for dogs prevents heartworms, fleas and other harmful parasites. Why buy 4 different treatments for 4 different parasites, when you can prevent them all with a single medication? Whether you’ve got a Doberman, Labrador, or a boxer their tails will wag with vigorous joy after a single treatment rids them of all their parasitic woes. Hi, this contains how many doses? How long does it last? This product contains 12 tubes for 12 months treatment. are the ingretants the same for both cats and dogs as in the advocate? Yes, the ingredient is Selamectin for both and cats. 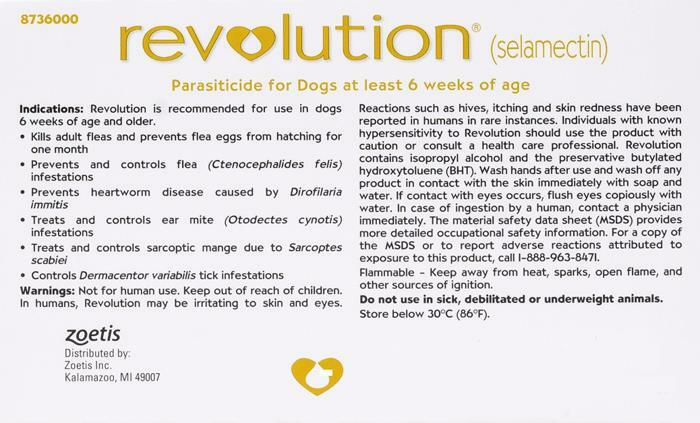 Hi, why is Stronghold 12 month supply of flea/tick/worm treatment cheaper than Revolution ? They look very similar ? What is the difference between them ? Hi, Both are exactly the same product with the same ingredient and the same formula. Pfizer markets them under different name in US and Europe due to licensing regulations, hence the price. Since I've changed to this product I now catch live ticks, instead of ones that are already bitting my dog. And No MORE ear mites!!!! Great product, very reasonable prices. Great customers service. Thank you guys!!! Great product, great service fast shipping.